So, Who was Dan Dedrick? So, Who was Dan Dedrick? Billy the Kid gave Dedrick a copy of his tintype...and approximately 130 years later, both their tintypes are up at auction. 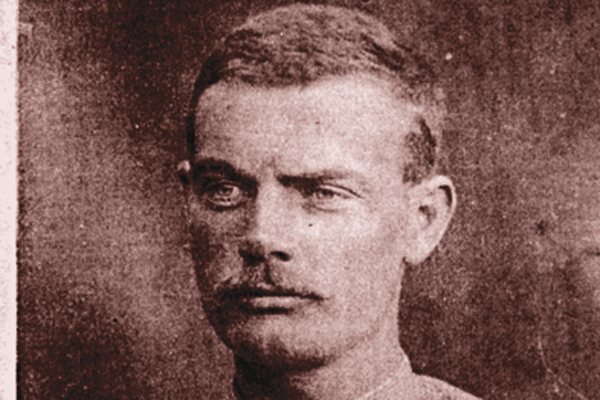 His real name was Daniel Charles Dietrich. Born of Pennsylvania Dutch stock in Indiana on January 25, 1847, he grew up near Plymouth, Kansas. 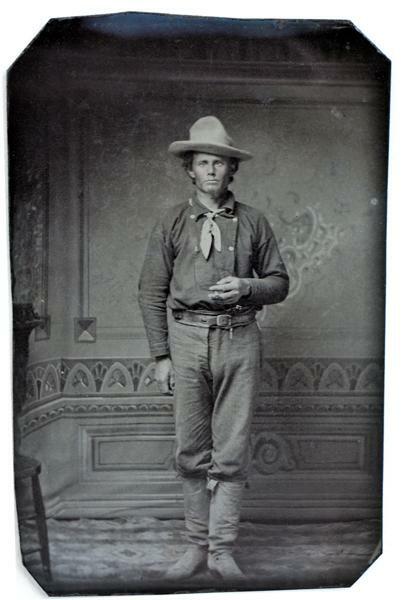 Exactly where the tintype of him was made is not known, but it was almost certainly before he arrived in New Mexico late in 1877 after (as one source suggests) escaping from a Fort Smith, Arkansas, jail. Family tradition says he fought in the Lincoln County War on the McSween side (which might account for his friendship with Billy the Kid). Wounded during the final five-day July battle, he carried the bullet in his crippled arm for the rest of his life. 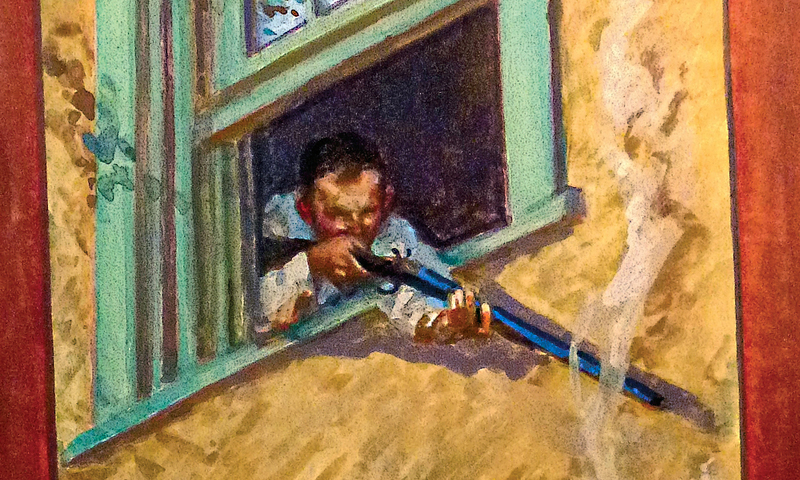 Later, having taken over the abandoned ranch of cattle king John Chisum at Bosque Grande on the Pecos River, he made it a welcoming safe house for men on the wrong side of the law— including the Kid. 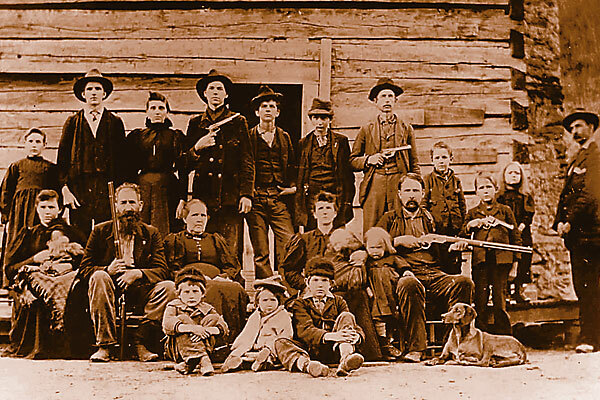 After gold was discovered at White Oaks in 1880, Dan and his younger brothers Sam and Moses opened a livery stable there in partnership with Harvey West, formerly Charlie Rath’s storekeeper serving the buffalo hunters at Fort Griffin and Mobeetie in Texas, who introduced the Dedrick brothers to the business of distributing counterfeit $100 bills. When complaints about the forgeries reached Washington, Secret Service agent Azariah Wild was sent to investigate. 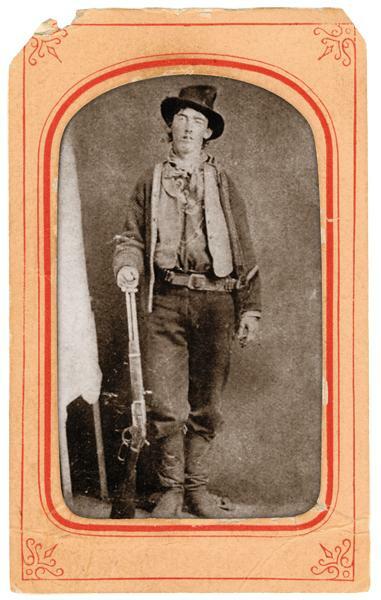 He reported the existence of a gang of outlaws, among them the Dedricks and “William Antrom [sic],” soon to be better known as Billy the Kid. He claimed they were involved in making counterfeit money, also known as “shoving the queer,” as well as wholesale cattle and horse theft. Law enforcement in Lincoln County was virtually nonexistent—perhaps because, Wild hinted, Sheriff George Kimbrell was in on the action. At the end of the year, Pat Garrett became sheriff, turning the heat on the criminal fraternity in general and Billy the Kid in particular. Sometime during that same period, an itinerant photographer took the Kid’s photograph—a Bon-Ton ferrotype—at Fort Sumner, only one copy of which has survived to the present day—the one Billy gave to Dan Dedrick. It may well have been a goodbye gift, because in November, under indictment for larceny, Dan skinned out with his brothers and Harvey West. In 1882, after a short stay in Socorro County, he settled in the Trinity Mountains of northern California, turning his hand to mining. He got lucky in 1890 and a small town—Dedrick—grew around his Chloride mine. After another strike south of Weaverville, Dan and wife Antoni built a home on Indian Creek, where they were later joined by their nephew Frank L. Upham, who would raise his own family there. Seven or eight years before his death in 1938, Dan gave the tintype of the Kid and another of himself, along with some later photos, to Frank. In 1947, Frank gave them all to his sister-in-law Elizabeth, who, for nearly 40 years, kept the Kid image in a cedarwood box, unaware of its unique value. Loaned to the Lincoln County Heritage Trust in the mid-1980s, it was reclaimed by the family years later. It has not been seen since—until now. 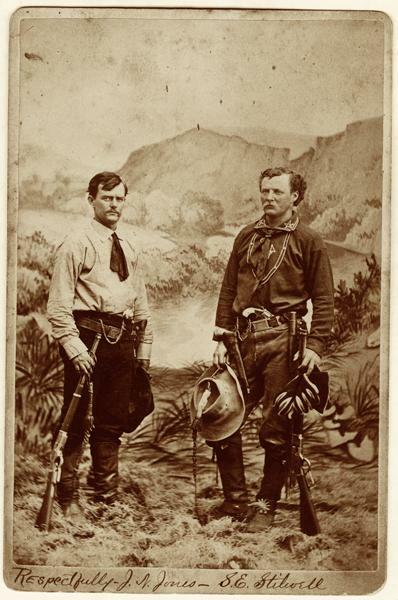 Both the Dan Dedrick and the Billy the Kid tintypes will be sold together in the Upham auction lot at Brian Lebel’s Old West Auction this June. 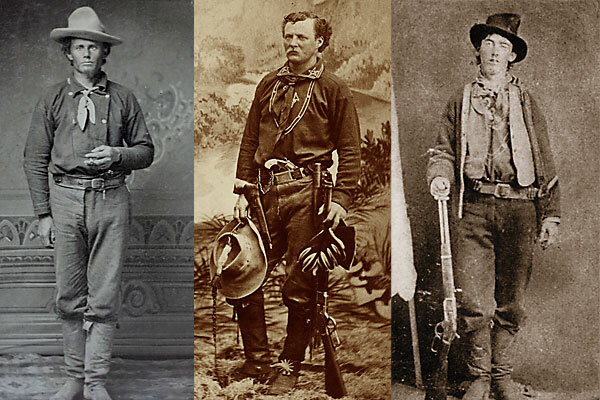 Billy the Kid, Jack Stilwell and Dan Dedrick are dressed in the style of the times. Note that all three wear bib front shirts, with the Kid and Stilwell sporting stylized designs on their bib fronts. All three tuck their pants into their boots (Dedrick and the Kid appear to have the exact same boots, with mule ears). Dedrick’s gun belt and buckle appear to be the same as the Kid’s. Looking at Dedrick’s hat style, it’s easy to see how the Kid dented his crown in a similar fashion. 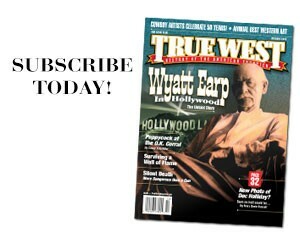 The Bloodiest Feud No moderation or regulation could be found in the east Texas war.